of a Roman numeral, an alphabetic character and an Arabic numeral. This designation constitutes the classification symbol based on the system in Mineralogische Tabellen by Hugo Strunz (a summary is shown in Appendix A). The Roman numeral and alphabetical character divide the minerals into broad groups based mainly on chemistry, with the silicate subdivision based on silicate polymerization. The Arabic numeral specifies the group to which a particular mineral belongs; a group is defined mainly on the basis of crystallographic similarities, but minerals with similar chemical compositions are sometimes included in the group even though they do not exhibit crystallographic affinities with other members of the class. The next entry gives the name of the author of the mineral and the date of its introduction into the literature. 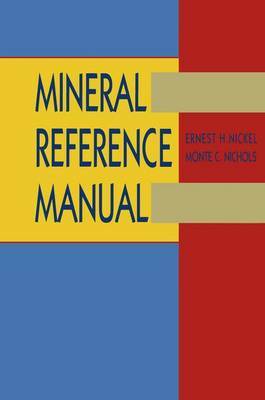 In some cases where a mineral has been redescribed or the name has been changed from the original, this entry will reflect the person and time when this was done. This is followed by a reference to what we have tried to make the latest, or most authoritative, literature report. We have attempted to include at least one reference for each species. If there is a second reference following the first, it will be a reference to the determination of the crystal structure. The abbreviations used in the references are given in Appendix B. The final entry, when present, gives the names of similar or related minerals and is preceded by the deSignation "See also" .